A Tom Lacy flute is the result of 46 years of flutemaking experience. After decades of working with other fine craftsmen and observing techniques used worldwide, I have designed a flute with integrity you can obviously see, hear, and feel. 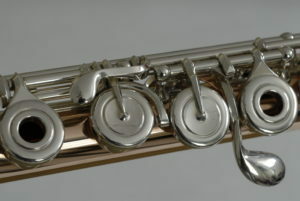 Unique advancements in keywork design have been incorporated into my flutes to insure reliability. I am now offering the latest improved scale available. RS 2012. Designed by Trevor Wye, William Bennett, and Eldred Spell. This scale allows the flute to play more in tune with itself than any other scale developed up to this point.